FQB "Inventions" Collection lets everyone's inner creative mix, boil, and formulate your scrapbook layouts and card ideas! 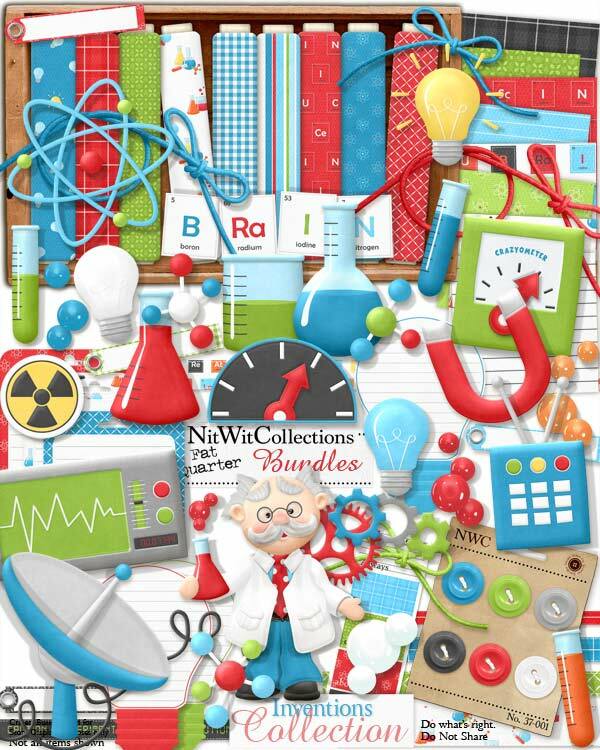 The digital elements in this kit give you so many options on how to use this kit.....how about for a birthday, a memorable science project or even a newly built home, shed or creation of your own. Take it all in and then mix, match, and create to see what your "Invention" will be! 1 Atom - no splitting now because we all know the hazards of that! 3 Beakers (with non-toxic contents inside) in various shapes and colours for you to begin your scrapbook and card making "inventions" with! 3 Bows to add some creative display properties to your new "invention"
1 Cord - where will you plug in?? 1 Crazyometer arrow....to pair with the Crazyometer....how high did you reach?? 1 Crazyometer - enough said! 1 Inventor - complete with lab coat! 1 Magnet - would be the perfect element for a scrapbook layout or card about how "magnetic" your mate/child/friend is to you! 1 Remote control box - you don't want to be too close when it all comes together!